Picture Perfects Painting & Power Washing offers expert power washing services to all of its Cape Cod residential and commercial customers. Low pressure power washing is the most efficient way to remove dirt, mold, mildew, weather marks, flaking paint, oil, and grease from all types of exterior surfaces. Our power washing equipment are experts on how to clean all areas including roofs from all elements, mold, and mildew. Our powerwashing biodegradeable cleansers we can use are perfectly safe for flowers, shrubs, plantings, and lawns. Power washing is often by a high pressure water rinse on areas that will not affect shooting water into and behind woodwork on house trim and siding. Our experienced power washing crew will ensure that the proper water pressures are used and your home and exterior surfaces will not be damaged in any way. Power washing is the most effective and efficient way to clean the exterior surfaces of your home. Pressurized water with biodegrable cleansers where plants and flowers are will remove dirt, mold, mildew, weather marks, peeling paint & flaking, and old chalking from your home's siding, trim, windows, and doors. Any remaining loose paint or caulking must be scraped by hand. Once the house is clean and dry, our painting contractors will proceed with the necessary exterior preparations before the painting begins. If your home has aluminum siding or vinyl siding, power washing with a mild detergent is a great way to bring back a bright, clean, new look. 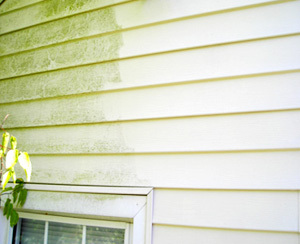 The investment you made in aluminum siding or vinyl siding can be protected and cleaned by powerwashing your home every few years on a regular basis. Power washing driveways, roofs, walkways, sidewalks, furniture, parking areas, etc. Power washing concrete, asphalt, brick, stone, slate, roofs, siding, shingle cleaning = We can make your old grey, black, weathered shingles look like new !!! The appearance of your home, roof, shingles, driveway, walkways, etc., will improve greatly and brighten with a strong power washing job. We can power wash most outdoors surfaces, including decking, bricks, concretem, asphalt, stucco, vinyl, and painted wood. We can bring your deck back to its original glory by cleaning and low pressure washing dirt, mold, and grime away and restoring the beauty of its natural wood grain. 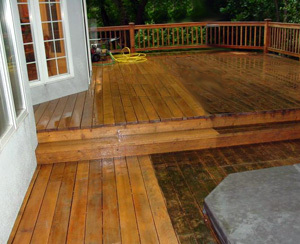 Pressure washing decks can also help to slow down premature wood rot and decay. 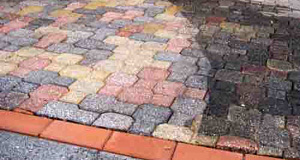 Many tyoes of terraces, patios, and fences can also be cleaned and restored with a good powerwashing. We can power wash many other surfaces residential or commercial, including yard statuaries & statues, swimming pools, pool patios, gutters, roofs, awnings, signs, stonewalls, and much more.